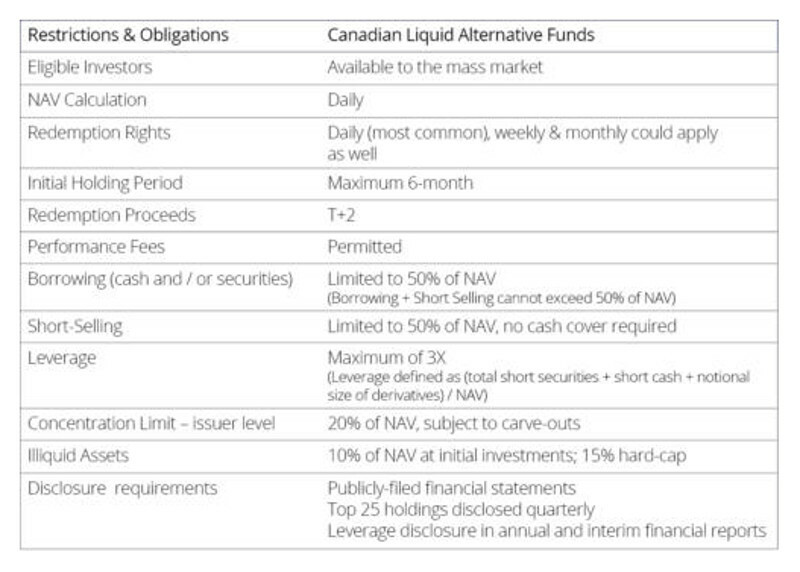 The Canadian mutual fund market, like the markets for European Alternative UCITS, and US ’40 Act Liquid Alts before it, is on the verge of historic change with proposed amendments to National Instrument 81-102 (the “Proposal”), which introduces a framework for offering greater choice to retail investors. This innovation is an extremely positive outcome for all participants, and should the proposals put forth by the Canadian Securities Administrators (“CSA”) be adopted, strategies, that were not readily accessible to retail investors will become available. Just because an AIM can theoretically convert its strategy into an alternative fund following implementation of the final rules does not mean it should. The necessity to honor liquidity demands is a key factor that should be taken into account when deciding to pursue Alternative Funds as a product option. Alternative Funds may have far shorter liquidity terms than hedge funds – daily, weekly or monthly, as compared to quarterly or longer, and as such, AIMs may need to adjust portfolio management to meet the more frequent redemption rights. Adjustments may not be difficult in terms of securities liquidity, however, the AIM must consider the impact of redemptions on returns, not only for the Alternative Fund, but for other portfolios under management. The use of leverage, shorting and derivatives, as well as diversification and transparency requirements should also be included among the AIM’s fundamental considerations. Certain strategies may not currently fit under the proposed rules. However, the CSA has indicated that it may support engagement with AIMs who want to launch a portfolio with characteristics that fall outside the proposed rules. Under certain circumstances, AIMs may be granted exemptive relief in order to launch products that currently exist outside the proposed rules. AIMs who would consider an innovative alternative investment product in Canada are encouraged to contact their local securities regulator to discuss the applicable securities law issues. In addition to determining whether an Investment Manager’s strategy is compatible with the Alternative Fund constraints, the AIM must also establish whether it has sufficient operational infrastructure to meet increased demands on the firm. To start, entering the Alternative Funds market will undoubtedly have an impact on the AIM’s human capital. For example, alternative strategies are complex, and significant effort will be required to educate investment advisors, financial planners and investors. There is an expectation by Canadian Mutual Fund Managers that AIMs will make Investor Relations personnel available to assist with marketing by participating in road-shows and conferences. Also, with increased regulation and investment restrictions, come additional compliance and order management responsibilities. Servicing this new product type is anticipated to increase the burden on these departments, which at many AIMs, are already working at, or close, to capacity. In addition to human resources, information technology costs need to be evaluated, as with increased regulation comes increased need for proper controls. For instance, many AIMs have existing allocation policies and procedures in place to govern the oversight of investment guidelines for multiple portfolios. ‘Pari passu’ managed portfolios are often eligible for pro rata investment allocations; adding a fixed regulatory framework to a pro rata regime may lead to surprises, and unintended consequences. Consider, for example, the not-uncommon scenario where an aggregated order is placed, and the shares allocated, pro rata, post execution. If the pro-rated portion of the trade allocated to an Alternative Fund would put the portfolio above a concentration limit, what happens to the ‘extra’ shares? Are they re-routed to a private fund? Is it fair to the private fund investors, who end up with more shares than the Portfolio Manager intended because of another portfolio’s restrictions? Would this be deemed a trade error under Manager policies? This is just one scenario that an AIM should review, keeping in mind, that tools, such as pre-trade compliance modules are available but come with a cost. In addition to the portfolio and operational considerations associated with managing an Alternative Fund, as stewards of retail investor capital, AIMs should also be comfortable with the potential increase in regulatory interest and scrutiny. As with any new investment opportunity, and change to an existing market, there may be increased regulatory focus, and even inadvertent issues related to policies and procedures can have a damaging effect on a Firm’s business. Who is bringing Alternative Funds to market? There are a number of paths Alternative Funds can take, on their route to retail investor availability. Alternative Funds may be launched by a conventional Mutual Fund Manager who introduces their own alternative strategy to the market; Alternative Funds may also be launched by alternative investment managers who introduce their strategy in the form of a mutual fund. Another potential path to market is a sub-advisory relationship between a traditional Canadian Mutual Fund Manager and AIM. The partnership between Mutual Funds Manager and AIM is designed to provide access to a wider pool of investment talent, increase brand awareness and facilitate training for the Mutual Fund Manager, while reducing the operational and marketing strains on the AIM. These are meaningful advantages that can ultimately benefit everyone - the retail investor above all. However, before blindly embarking on a sub-advisory partnership, it is worth noting that the relationship does not completely eliminate the challenges of distributing an Alternative Fund. The AIM, for example, will be subject to oversight in the form of unaffiliated Directors, and will be required to abide by the compliance program of the Mutual Fund Manager. The Mutual Fund Manager, for example, will be subject to heightened oversight responsibilities. Given alternative investments in Canada have historically only been available to accredited and institutional investors, there is a ‘knowledge gap’ in the Canadian retail marketplace. This gap spans the universe of participants in the market-place, each of which plays a different role in the education process. Retail investors: For most Canadian retail investors, everything associated with an investment in alternatives will be new. Investors will need to gain an understanding of, for example, the strategies, the managers, and the risks, benefits and impact of an investment on their overall portfolio. Investment advisors/financial planners: Distributors, with the most direct relationship with investors, will need not only to mirror the knowledge of investors, but be able to teach investors. Advisors may be subject to heightened scrutiny of investor suitability, and their role in establishing / vetting risk ratings serves to further increase the level of understanding required. Sponsors: Located at the epicenter of knowledge distribution, Mutual Fund Managers will need to provide insight downstream to Investment Advisors, and upstream to the Regulators. Mutual Fund Managers will likely have the most direct contact with the AIMs, so will be best positioned to distribute intelligence on processes, progressions, challenges and opportunities. Regulators: Though the Canadian regulators have spent significant time analyzing alternative investments, the launch of the market will require well-informed oversight and knowledgeable management. Ongoing communication with Mutual Fund Managers, Advisors and Investors will increase transparency and provide the road-map for effective supervision. With demand for liquid alternative funds in Canada estimated to exceed $100 billion, the significance of this transformation cannot be underestimated. It will be the responsibility of all participants across the spectrum – sponsors, investment managers, investment advisors and service providers – to deliver peak performance and quickly substantiate the integrity and veracity of the Alternative Funds market for the retail investor. CIBC’s Capital Markets business provides best-in-class insight, advice, and execution across global markets, investment banking, corporate banking and research to corporate, government and institutional clients in key markets globally. For more information, please visit www.cibcwm.com.